The New Milwaukee HD18HX Cordless SDS Hammer Drill 2 x Batteries (HD 18 HX) has a massive 2.4 Joule blow energy! using the 18 V RED Li-Ion Technology with 4.0 Ah for up to 40% longer run time. This model has the VARIOLOCK, this allows the Chiselling angle to be locked at various positions so offering effective, ergonomic handling. It has all metal gear case that provides maximum durability and a hammer stop function for drilling in wood or metal. The FIXTEC SYSTEM allows for Keyless chuck changing and Fast & easy handling. 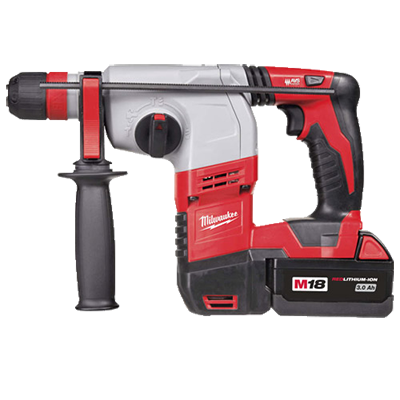 The Milwaukee HD18HX Cordless SDS Hammer Drill comes with the REDLITHIUM-ION™ batteries, these will provide unmatched run-time, performance and durability for the professional tradesman.